For today and tomorrow only, you can save 20% on ANYTHING in the store, just by using this coupon code! <=== Click the graphic to be taken to the store. In addition to your 20% savings, you'll receive a FREE gift with EVERY order placed today and tomorrow! AND if you spend $75 or more, you'll receive this absolutely adorable Conductor of Light stamp set! $150 orders will also recieve the coordinating die set absolutely FREE, too! To see more about this stamp set, please visit Julie's post today over on the Ellen Hutson the CLASSroom blog here. Ready for some more 12th Anniversary fun? Head over to Instagram, where a fabulous group of crafters have put together a "Warm Fuzzies" themed hop to express our gratitude to Ellen for everything she has done for the papercrafting industry! You'll find a bunch of sweet, lovely cards to fill your week -- there's a different group showing their appreciation with a bunch of different and new project inspiration every day! You can start off at my Instagram account HERE, then click on the person I've tagged, to head on through the rest of the hop! This adorable All Inside bear has been one of my very favorite stamp & die sets from the Essentials by Ellen line ever since he made his debut! And equally adorable are his Bear Ware accessories of the balloon, bunny, and honey pot I used on this card . . . they just make my heart melt!! What equally makes my heart melt are the AMAZING brand new Daniel Smith Watercolor Half Pan Sets Ellen started carrying in the shop recently. I haven't been able to put them down! I can only describe them as soft & buttery -- they reactivate with your watercolor brush SO very easily and can easily be worked and re-worked after they are on your paper. They are simply amazing!! Shown below are the Ultimate Mixing set (left,) and (upper right) -- my PrimaTek set that I panned and mixed into the Blues set case. The Ultimate Mixing set is a great deal -- in addition to the 15 pan colors in the set and their great little case that makes them perfect for travel, you receive an ADDITIONAL empty 15-pan case that you can fill with any additional tube paints you'd like! After watercoloring and die cutting the sweet images with their coordinating All Inside and Bear Ware dies, I mounted them with foam tape onto the background, around the twisting balloon (white embroidery floss) string. To finish the card, I stamped the sweet Warm Fuzzies sentiment on a watercolor cardstock strip, to anchor the images, then accented the bear's nose and his honey pot with Glossy Accents. The final touch were a few of Ellen's FABULOUS new Essentials by Ellen Crystal Clear Hearts -- People, these things are the absolutely BEST quality of clear droplets I have ever seen!! I was always frustrated by other brands of "crystal clear" usually having a bubble in the center of them, making them not very crystal clear in my opinion. You won't find that in Ellen's new brand of accessories! (And the Crystal Clear Droplets are just the same outstanding quality!). Thanks so much for joining me today! 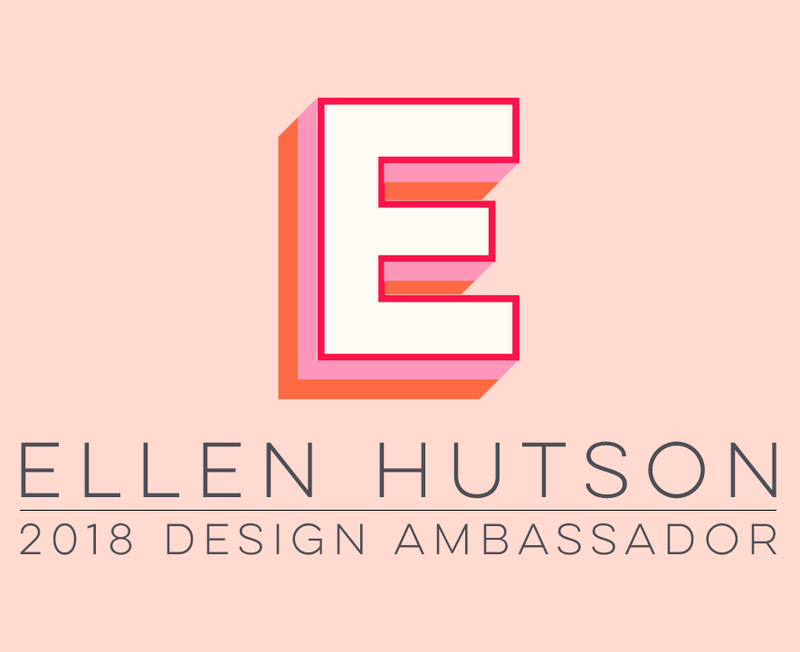 I'll be back on Friday with another Ellen Hutson 12th Anniversary celebration project!